Kay Hagan (D-NC) leads 2014 Senate race, but shouldn't get too confident. North Carolina going blue in the 2008 election to red in the 2012 election. Democrat Kay Hagan remains largely unknown and hardly-liked after 4 years as Senator, with a job approval/disapproval rating of 34/36%. The one bright-spot for Democrats in North Carolina is the fact that at this early stage of the 2014 cycle, there appears to be no credible Republican challenger to Sen. Hagan's seat in Washington. Despite her apparent middling poll numbers, all 7 potential Republican challengers tested by PPP failed to get closer than 6 points to the U.S. Senator who 31% of her constituents have no opinion of. Two possible GOP candidates tie for coming the closest to Sen. Hagan: Rep. Renee Ellmers (R), a 2-term Congresswoman from the 2nd district trails just 46-40%, and Rep. Patrick McHenry (R), a 5-term Congressman from the 10th district trails 45-39%. Hagan's weakest opponent, NC State Representative Thom Tillis trails by 10 points, 47-37%. Virginia Governor Bob McDonnell (R) has been polled twice by two major polling companies at this early stage in 2013, and both find Virginians APPROVING of his job performance by large margins. Yet despite his strong standing with voters, he would struggle in a 2014 Senate race, or a 2016 presidential race, according to Public Policy Polling. Two of the four most frequent pollsters in Virginia diverged somewhat from the average, with PPP tending to show McDonnell MUCH less popular than Quinnipiac's average, Rasmussen's average, AND Roanoke's average. In fact, Bob McDonnell only manages a +11 average job rating from PPP (46/35%), as compared to the +25 rating from the average of all polls (55/30%). The Governor of New Jersey had reason to rejoice last week when Public Policy Polling released a poll summarizing all of the major possible 2016 presidential candidates favorability ratings. 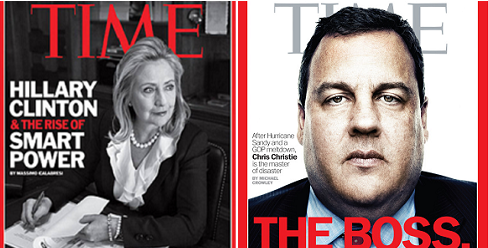 Not only is Christie the most liked national politician of the 18 PPP chose to test (he has a net 28 pt favorability rating, with 51% viewing him favorably, 23% unfavorably), but he is the only Republican that even comes close to giving Hillary Clinton a run for her money in a hypothetical 2016 match-up (trailing her just 44-42%). But the biggest story from the PPP release seems to have been lost by most of the media and punditry - Hillary Clinton has taken a pretty fair hit in her favorability rating. 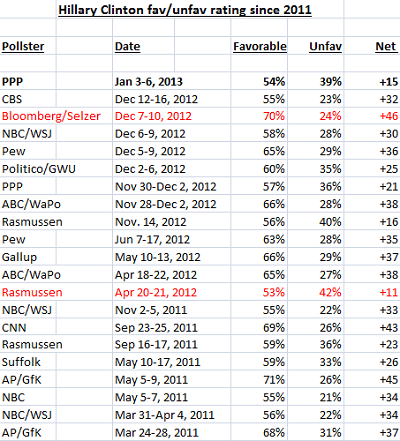 Over the course of the last two years, Clinton has averaged a very strong 61/30% favorable/unfavorable rating. Though that impressive average only serves to highlight how poor Hillary's current PPP rating is comparatively. 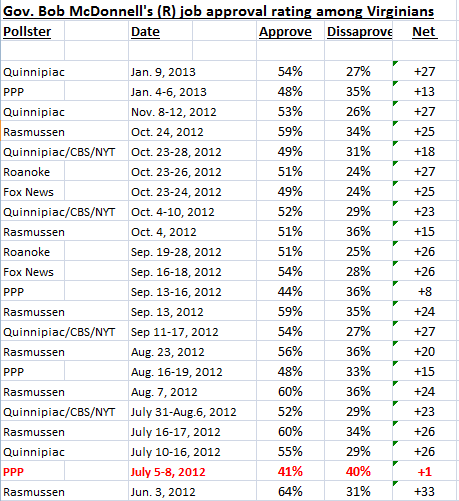 In fact, the current PPP numbers are Hillary's 2nd worst since January 2011 (Rasmussen measured Hillary's favorability at 53/42% in April 2012, the only pollster to show Hillary weaker than PPP for the last two years). Democrats poised to win historic 2nd term, mid-term election (per PPP, of course). Pic courtesy of the A.P. Low and behold, Public Policy Polling is out with a brand new poll that shows Democrats poised to gain seats in their party's 2nd term, mid-season election. What's so special about that, you might ask. Probably the fact that the President's party has lost every 2nd-term, mid-term election since 1938, with just one exception: 1998. But if PPP is right, Democrats would win the House of Representatives today by a 6 point margin, 47-41%. To be fair, yes, Republicans DO seem to be in a state of dissaray post-November 2012; they lost an election that was supposed to be painfully close by a not-so-painful 4 points, they were forced through fiscal cliff negotiations to accept tax hikes without spending cuts, and external events (Newtown massacre) put the GOP at odds with public opinion. But if the Democrats were to actually defeat the Republicans in November 2014 by 6 points, it would be historic. In fact, in the mid-term election of every 2-term president since 1950, the best the President's party did in the popular vote was was 51% in 1966, to the Republicans 48%. Yet despite that 3 pt popular vote victory for the Democrats, Republicans still gained 47 seats. 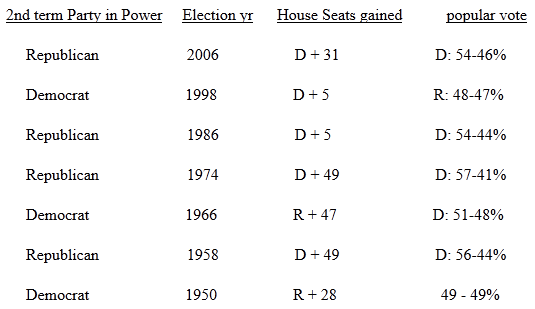 The below chart documents the results of every 2nd term, midterm election since 1950. As you can see, if PPP's results hold up between now and Nov. 2014, it would be a historic popular vote victory for the Democrats. But a close look at PPP's internals reveals what COULD be driving the Democrats 6 pt lead on the House ballot. Poll respondents identified as 43% Democrat, 34% Republican, and 23% Independent, or D+9. That's 3 points MORE Democratic than we saw in the electorate just 2 months ago, when it was D+6. Not only that, but PPP's party I.D. is more Democratic than every midterm election since 1986. Info courtesy of the Washington Post. 2013 Virginia Governor: PPP paints bleak picture for the Cooch (R). Quinnipiac? Not so bleak. From left, Cuccinelli, Gov. McDonnell, & Lt. Gov. Bolling after their win in 2009. Oddly enough, the man on McDonnell's left has said he would not be on a ticket with the man on McDonnell's right. Public Policy Polling released their first poll on the 2013 Virginia Governor's race yesterday, and the results weren't great for likely Republican nominee, Ken Cuccinelli. The former Attorney General only managed to garner 41% against his probable opponent, failed 2009 Democratic candidate and Clinton-confidant, Terry McAuliffe (who managed 46% in the PPP poll). This result closely mirrors a Quinnipiac poll from November that showed McAuliffe up 41-37%. PPP survey weighted to 2009 VA Gov ideological I.D. How, exactly, is it that Cuccinelli (R) still trails McAuliffe (D) 46-41%, despite reweighting the numbers to a LESS liberal ideological make-up? Because regardless of the drop-off in liberals, moderates were a much larger percentage of the 2009 electorate than what PPP found in their poll. 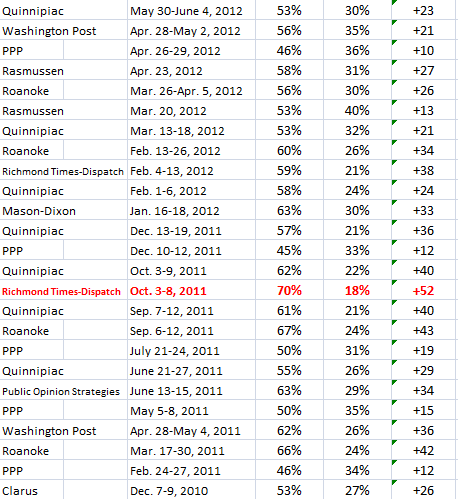 And unfortunately for Cuccinelli, the Republican trails the Democrat among moderates by a substantial, 61-25% margin. That was NOT the case in the 2009 gubernatorial race between Gov. McDonnell (R) and Creigh Deeds (D), when the Democrat carried moderates by a much narrower 53-47% margin. That difference in the performance of Cuccinelli and McDonnell among moderates is the main reason the Republican does just as poorly whether the numbers are weighted to the PPP ideological finding, or the 2009 ideological finding. 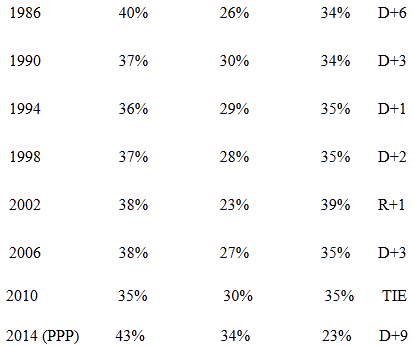 IF, somehow, the Cooch were able to get 47% of the Moderate vote (as McDonnell did in '09), HE would lead the PPP poll, 51-42%, a 14 pt reversal from the actual PPP result.